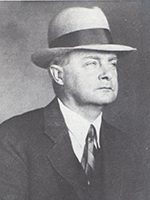 Charles F. Woods became Riverside’s city librarian in 1922, succeeding Joseph Francis Daniels who had held the position during a period of expansion under Herschel Carnahan, president of the board of trustees. Unlike the Daniels-Carnahan years, Charles F. Woods was plagued by political and fiscal conservatism after accepting the post and arriving from the San Jose Free Public Library. His initial optimism, expressed by his description of Riverside as the “best library city in the State of California,” continued to be undermined as the city council lowered the tax levy for the library in 1926. Woods and the entire board of trustees resigned. Mayor John T. Jarvis appointed a strong group of library advocates who renegotiated the levy and reinstated Woods. Woods established “book stations” in Casa Blanca and at the Community Settlement House in Riverside’s Eastside in 1926. Woods had hired the first children’s librarian in 1925 and in 1930, the children’s room at the library evolved into a separate building, occupying Humphrey House, next door to the Unitarian Universalist Church. That same year, however, the fiscal realties of the Great Depression came home and the library lost almost half its public funding.